Self-regulation in education is a familiar and important topic for all educators: professors, administrators, teachers, researchers, journalists, and scholars. As educational standards require that students take control of what and how they learn, self-regulation skills are essential to student success. Written by a leading expert on self-regulation and self-regulated learning, this book situates the topic within the broader context of educational psychology research and theory, bringing it to a wider audience. With chapters on the fundamentals of self-regulation, explanations of its uses, and advice for best application, this concise volume is designed for anyeducation course that includes self-regulation in the curriculum. It will be indispensable for education researchers and both pre- and in-service teachers alike. Jeffrey A. Greene is Associate Professor in the Learning Sciences and Psychological Studies program in the School of Education at the University of North Carolina at Chapel Hill, USA. "Because schools haphazardly teach study tactics and skills for solving information problems, learners need to become productive self-regulating learners. What is SRL, really? How do SRL and self-regulation articulate? When and why should learners apply these tools, and how can we help learners develop them? Synthesizing the spectrum of modern research, Greene expertly integrates accounts of mechanisms with careful analyses of findings and interventions. His book is not just a good read, it is fruitful, as well." "Greene, a leading scholar on self-regulation with a long history of professional success, a proliferate writer, and an extraordinary and charismatic educator, mesmerizes [and] places his readers in a situation in which they are called to actions. . . . Self-Regulation in Education is an inordinate book that should be on the desk of every educator and learner." Why Study Self-Regulation in Education? What is Self-Regulation in Education? How Does Self-Regulation in Education Relate to Learning and Achievement? How Can Educators Help Students Become Better Self-Regulators in Education? What is the Future of Self-Regulation in Education? Self-regulation in education is a familiar and important topic for all educators: professors, administrators, teachers, researchers, journalists, and scholars. As educational standards require that students take control of what and how they learn, self-regulation skills are essential to student success. Written by a leading expert on self-regulation and self-regulated learning, this book situates the topic within the broader context of educational psychology research and theory, bringing it to a wider audience. 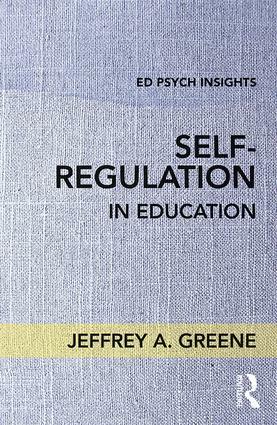 With chapters on the fundamentals of self-regulation, explanations of its uses, and advice for best application, this short volume is designed for anyeducation course that includes self-regulation in the curriculum. It will be indispensable for education researchers and both pre- and in-service teachers alike.